Alwynne Richard Owen Rowlands was born on 26 September 1937 and educated at Melbourne Grammar School. Rowlands undertook study at the University of London in 1955 and the following year he joined the RAN Reserve as a Midshipman (supply and secretariat branch). He was promoted Sub-Lieutenant in 1957 and Lieutenant in 1960. Alywnne Rowlands graduated from the University of Melbourne (LL B) in 1962 and was admitted to the Victorian Bar in 1963 (ACT 1974 and NSW 1975). He transferred to the Naval Emergency Reserve Forces in 1966 and was promoted Lieutenant Commander (legal branch) in 1972 and Commander in 1979. His legal career progressed following his appointment as a Queen’s Counsel in 1982 and as a Judge of the County Court of Victoria in 1983. 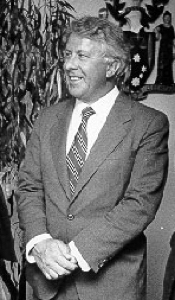 Rowlands was also the Foundation President of the Administrative Appeals Tribunal of Victoria during 1984-87. Following this he became Presidential Member of the Federal Administrative Appeals Tribunal and a Judge of the Family Court of Australia in 1988. The following year he was appointed as Judge Administrator of the Family Court of Australia remaining so until retiring in 2005. In 1987 Rowlands was promoted Commodore and appointed as Judge Marshal of the Royal Australian Navy; a position he held until 1992. Additionally, he was Deputy Judge Advocate-General of the ADF during 1989-92. Alwynne Rowlands was appointed a Rear Admiral, RANR in May 1992 and became the Judge Advocate General of the ADF. He relinquished the position in 1996. Rowlands was appointed an Officer in the Order of Australia (AO) in the Queen’s Birthday Honours List in 1994 for distinguished service and exceptional performance of duty to the Royal Australian Navy and the Australian Defence Force, particularly as the Judge Advocate General. In 2003 he became a councillor of the Royal Humane Society of NSW. Alwynne Richard Owen Rowlands, AO, RFD, RD retired from legal practice in December 2005.